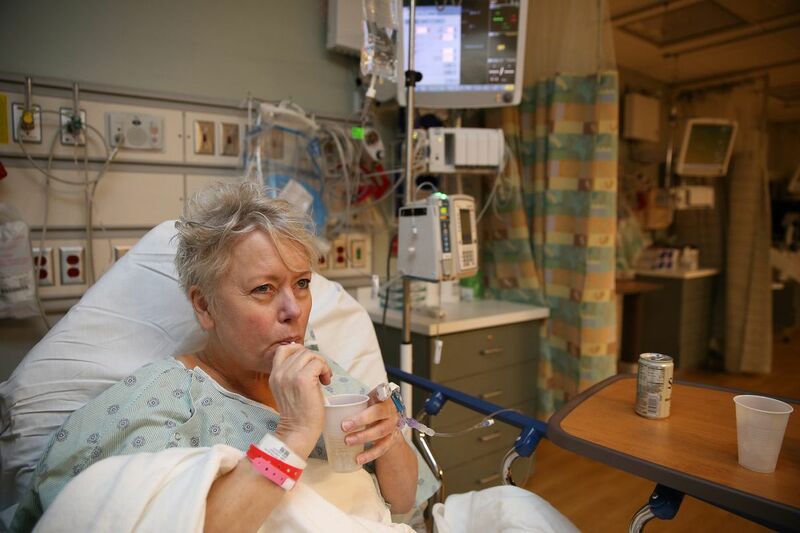 Patient Beth Thompson takes a drink after surgery at Cooper University Hospital. The hospital is reducing the use of intravenous fluids when possible. As she bided her time before she could go home after a minor surgical procedure, Beth Thompson did what might seem like an unremarkable thing: She drank ginger ale. Thompson, a veterinarian from Delran, was doing her part to help Cooper University Hospital in Camden combat a shortage of intravenous fluids that is bedeviling hospitals throughout the country even as an unusually bad flu season fills their beds. Cooper has been switching surgical patients from IV fluids to oral fluids as soon as it can, and Thompson was happy to oblige. "If I can drink," she said, "I'll drink." Rick Demers, pharmacy director for the Hospital of the University of Pennsylvania (HUP), said that his hospital has been dealing with "inconsistent" supply of IV fluids for two to three years, but that the situation grew far worse after Hurricane Maria disrupted key suppliers based in Puerto Rico. Joseph Montella, a physician who is vice president of medical affairs at Cooper, said plants are producing more fluids now, but hospitals have been told to expect problems at least through the end of March. While IV fluids are not the only drugs in short supply, they are staples of hospital care, and hospitals have been scrambling to conserve them. "Every patient who comes to a hospital, for the most part, receives some kind of IV fluids," said David Showalter, system director of pharmacy for Main Line Health, which uses 19,000 bags of IV fluid a week. He said his allocation of key fluids is down by 10 percent to 15 percent. A small pile of IV bags sits in a bin inside the pharmacy at Cooper University Hospital in Camden. The shortages ebb and flow, but include saline solution (salt water) and dextrose solution (sugar water) that are used not only to keep people hydrated but to dilute many medications usually given through IV pumps. As medical supplies go, they're relatively cheap and easy to make, but hospital leaders said safety regulations are tough enough that not just anyone can step in and produce them. Only a handful of companies make them. A recent survey of pharmacists practicing at hospitals by the American Society of Health-System Pharmacists found that 85 percent were coping by using alternative ways of delivering medicines that required less saline; 64 percent were buying premixed or frozen drugs not on their formularies, and 60 percent had started restricting use of IV fluids. Mark Ross, southeastern regional manager of emergency preparedness at the Hospital and Healthsystem Association of Pennsylvania, said he has been monitoring the supply of intravenous supplies throughout the state for months. Hospitals have shared supplies when necessary and have not had to cancel surgical procedures because of the shortages. Montella said Cooper is now getting 70 percent to 75 percent of the IV fluids it needs, up from about 60 percent in December. Brian Swift, enterprise vice president and chief pharmacy officer for Jefferson Health, said his supplies are approaching normal levels but remain very tight. "It's really a tragedy that the supply chain for IV fluids is as brittle as it is," Swift said. Jefferson has five or six people working full-time on drug shortages, he said. Area hospital officials said they evaluate supplies daily and modify how fluids are used. Bags come in multiple sizes. Which size is hard to get varies. As a result, pharmacists must recalculate the way they mix and deliver drugs through bags of different sizes. Sometimes nurses can also inject drugs slowly through an IV port in what is called an "IV push." Syringes needed for that procedure are now harder to get, as are empty IV bags. "The whole country is doing the same thing," Demers said. This all means that hospitals have to change procedures frequently, and that increases the odds of mistakes. "We definitely recommend standardized practices," said Juuso Leinonen, senior project engineer in the ECRI Institute's health devices group. ECRI studies the safety and efficacy of medical processes. "Spontaneous change challenges the system," Demers said. "From any quality and safety paradigm, you want everything you're using to be as consistent as possible." Like other area hospital officials, he said Penn has avoided mistakes so far. At Cooper University Hospital, Joseph Montella, vice president of medical affairs; Lisa Laphan-Morad (center), associate chief nursing officer, and Jacqueline Sutton, director of pharmacy services, are part of a team that monitors drug shortages and figures out how to address them. Cooper, which orders a million bags of IV fluids a year, has reduced use of IV basics such as saline and dextrose by 30 percent by changing some longtime practices. The staff now evaluates whether patients really need fluids twice a day. Patients are switched to oral medicines as soon as possible. In the past, anesthesiologists routinely prepared a second bag of fluids for use after surgery, Montella said. Often, as in Beth Thompson's case, that second bag wasn't needed and was wasted. Those changes will stay in place even after the shortage ends, Montella said. Terese Kornet, director of clinical nursing systems at HUP, said changing how patients get drugs has more repercussions than you might think. If you mix drugs in a bag that's not the usual size, that alternative has to be added to the electronic medical record. The computerized "libraries" of infusion pumps also have to be modified. Nurses have to be trained. "It's a significant amount of work for the pharmacists," she said. Injecting drugs into IV ports also takes time for nurses. If it's going to take more than five minutes, Penn prefers that nurses use syringe infusion pumps. Such pumps are the preferred delivery method, said ECRI's Leinonen. After the hurricane, Penn bought 100 syringe infusion pumps for $600 to $700 each, Kornet said. She said all the change slows nurses down. "You always have to stop and think, 'I'm seeing something I'm not used to seeing.' "
Robert Campbell, an anesthesiologist in central Pennsylvania, who is chairman of Physicians Against Drug Shortages, says the shortage of IV solutions goes well beyond Hurricane Maria and tough regulations. He traces the problem to big buying groups that he believes have encouraged consolidation among companies that produce the medical supplies. He said his anesthesia group, which works in ambulatory surgery facilities, has plenty of IV saline. "What we do and what a lot of places do is we hoard," he said. "We have a hallway stacked to the ceiling with salt water."